Many medieval priories bear witness to a turbulent history and none more so than Lanercost Priory. Dating from the mid 12th century, Lanercost was an Augustinian Priory built close to Hadrian's Wall. It was therefore en route from England to Scotland when King Edward I of England journeyed once again to do battle with the Scots, this time in 1306. Suffering from poor health and with a cold, bleak winter on the horizon, the King decided to make Lanercost Priory his home, and that of his 200 strong retinue, for several months. When he left in the Spring of 1307 he left behind him a rural community drained of resources which took a long time to recover. Ironically, after all they had done for their King, he died only 5 months later. Just 5 years later it was another king, this time Robert The Bruce, King of Scotland who came to Lanercost Priory, leading an army up to its very doors. Today Lanercost Priory is a beautiful church open to the public where services are still held. Its colourful history echoes in every piece of stone and even in the air as you walk around its grounds. 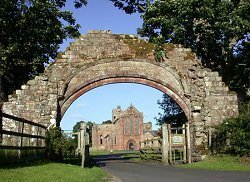 However, if you cannot get there to see it for yourself, we have something that might help as the next best thing - a video of Lanercost Priory set to beautiful music (courtesy of Stephen Caudel).